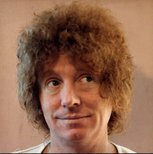 When Brett Whiteley and his family arrived back in Sydney permanently at the end of 1969 after a decade abroad, his reputation with illicit drugs preceded him spectacularly. Seven years later his controversial ‘Self-portrait in the studio’, which was awarded the Archibald Prize for 1976, was at once the image of an expansive life on the shores of Lavender Bay, and symbolic of a cage of serious heroin addiction within which Whiteley had found himself, and that would bring about his eventual demise. Two years on Whiteley entered another controversial self-portrait into the Archibald - ‘Art, life and the other thing’ - and it too made an immediate impact. That year he got the trifecta, awarded all three prizes including the Wynne and Sulman. 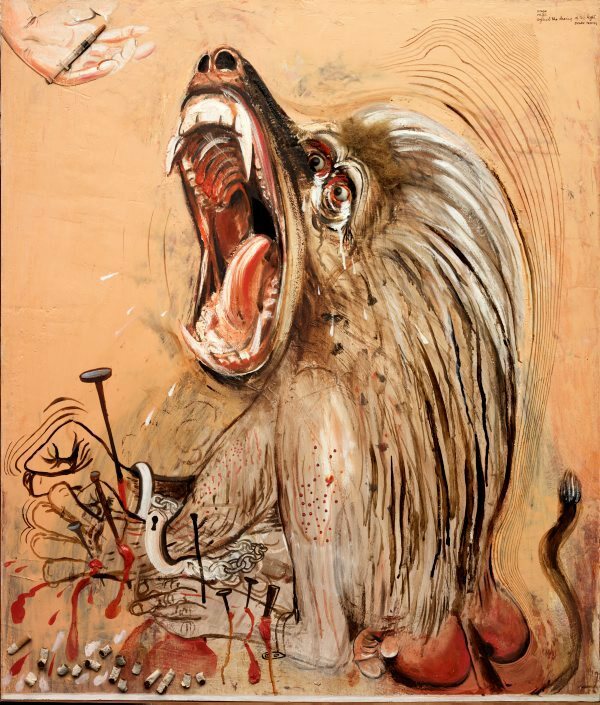 However now, his self-portrait was a far more bold, almost grotesque confessional, an elongated image of himself referencing the infamous debate over William Dobell’s Archibald-winning portrait of Joshua Smith of 1943, flanked on one side by a simian beast howling with anguish as a ghostly hand delivers it a syringe, and on the other a photograph of the artist looking serenely normal. Unlike ‘Self-portrait in the studio, critics were divided about ‘Art, life and the other thing’, perhaps because of its sheer sensationalism, and lack of subtlety of the earlier work. Almost too brutally honest, it seemed like the final flaring of a dying star. Many who were close to Whiteley, then aged thirty-nine, felt sure he would not survive beyond forty. However he did survive for another fourteen years, finally succumbing fatally to his addiction in a motel room at Thirroul on the south coast of New South Wales in 1992. Signed and dated l.r. centre panel, black ink "brett Whiteley 78". 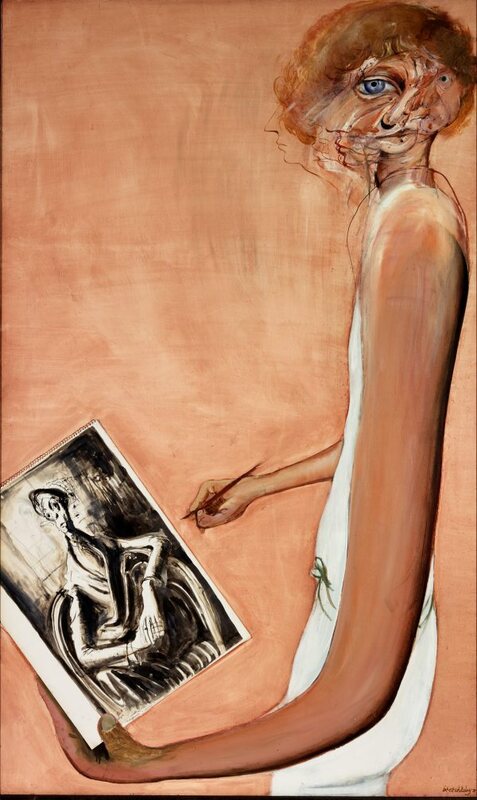 Signed verso, black oil on masking tape "BRETT WHITELEY". Peter Cochrane, The Sydney Morning Herald , 'Artist was the $1m man', pg. 17, Sydney, 17 Jun 1992, 17 (illus.). David Evans and Elizabeth Fortescue., Daily telegraph mirror , 'Whiteley: The fatal flaw', Sydney, 17 Jun 1992, (illus., detail). Alec George, Look , 'Whiteley's 'inner paddock', pg. 26, Sydney, Jun 2014, 26. Janet Hawley, Good Weekend Magazine , 'Brett Whiteley: the art of the warrior', pg. 16-26, Sydney, 17 Feb 1990, 22. Janet Hawley, Artists in conversation , 'Brett Whiteley', pg. 92-107, Richmond, 2012, 95. Bruce James, Whiteley with words , 'Whiteley with words', pg.2-4, Sydney, 2000, 8. John MacDonald, The Sydney Morning Herald , 'On our selection: a moonlit mix', pg. 16-17, Sydney, 21 Feb 2009-22 Feb 2009, 17. NOTE: Review of 'Great Collections' exhibition. Anna Waldmann, Art and Australia (Vol. 20, No. 2) , 'The Archibald prize', pg. 213-236, Sydney, Summer 1982, 235 (colour illus.). Frank Walker, Herald Sun , 'What lies beneath 95% of gallery's art collection hidden in basement', pg. 18, Port Melbourne, 30 Dec 2007, 18 (colour illus., detail). Margherita Zanoletti, Literature and aesthetics: the journal of the Sydney Society of Literature and Aesthetics [vol 17, no 2] , 'Figures of speech/ Figure retoriche: Verbal and Visual in Brett Whiteley', pg. 192-208, Sydney, Dec 2007, 192, 198, 199 (illus. ), 200-206. Let's face it: the history of the Archibald Prize , 'Into the 1970s', pg. 63-87, Sydney, 1999, 78 (colour illus. ), 136 (colour illus.). Cambridge visual arts: stage 4 , Cambridge, 2008, 122 (colour illus.). Great collections , Sydney, 2008, 108 (colour illus.). The Archibald Prize 1921-1993 , Sydney, 1993, cover (colour illus. ), 8 (colour illus.). 9 Shades of Whiteley , Sydney, 2008, 3. The Archibald Prize: an illustrated history 1921-1981 , Sydney, 1981, 235 (colour illus.). Let's face it: the history of the Archibald Prize , ‘Chapter 4: Into the 1970s’, pg. 61-85, Sydney, 2005, 76 (colour illus. ), 77, 146 (colour illus.). 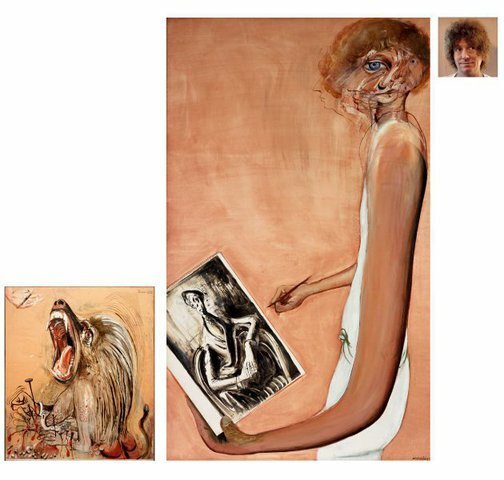 William Dobell: portraits in context , 'Image of contention', pg. 10-20, Kent Town, 2003, 10. Drugs: a social history , 'Intoxicated dreamers', 7-9, Glebe, 2003, 6 (colour illus.). Exhibition guide produced by the Justice & Police Museum for the exhibition 'Drugs: a social history', 25 October 2003 - 10 October 2003.